You may think the command below is an "alias" of the one above for unstaging a file. If the file hasn't been committed, then it would unstage the file and keep it locally. However, if it does already exist in the repo, it would actually stage it for removal! If you run the command above on a file that already exists in the repo, you will be staging it to be removed! It's an extremely good idea to use an alias for the command above, such as gg. This does not automatically switch you to that branch. This will create a branch from whatever branch you are currently in rather than always from master. Perform this command if you created a local branch that doesn't exist on remote. If you have a branch in your central repository, such as Github, then chances are that you want to use the following code to create a local branch of the same name that will track the remote one. The command below will allow you to checkout a remote branch and give it a different name, but I recommend you just use the previous command for creating a local branch that mirrors remote instead. You may wish to do this multiple times and commit as a single commit. In such a case just make sure to use the --no-commit flag on each cherry-pick, and then manually commit when you are done. git tag -a [tag name] -m "[tag description/log]"
Note: You can specify just push or fetch if you only intend to perform one of those. If you moved your remote repository, then you can just update the remote instead of adding the new location and removing the old one. When you want to update a branch from upstream (usually master), you have two options. Merge and rebase. Rebase can be confusing for newcomers coming from SVN, so I just wanted to provide this diagram of the difference. As you can see, the rebase will give you a much cleaner looking history. 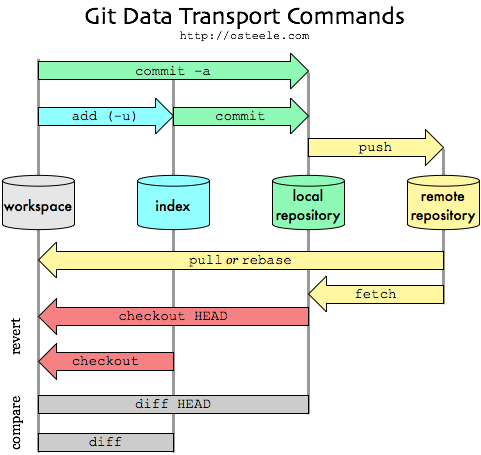 However, the diagram does not clearly convey the point that in a rebase, each point in the branch's history (purple points) will be considered a new commit after a rebase operation. This is why its okay to rebase your local branches, but it's not okay to rebase something that has gone public. Merging is perfectly okay for things that have been pushed publicly. I found the section on git rebase from Atlassian most useful. Read about how to do it here. 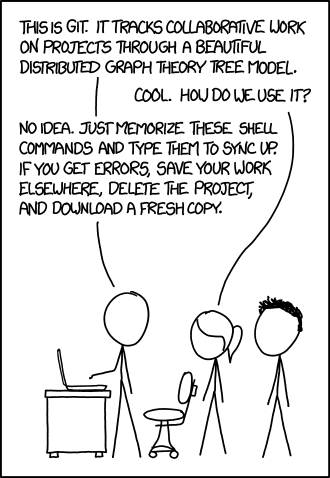 Alternatively, you could edit the .git/config file directly. It is possible to configure colour coding on only certain aspects, or even change the colours themselves, but that is beyond the scope of this tutorial. Git allows you to set aliases. e.g. This would allow you to run git cp instead of git cherry-pick. However this would likely cause confusion with the linux copy command which is also cp. Bare - Nobody directly uses the repo, but is used for a centralized area for multiple developers to push and pull from. (Like your SVN repo). Shared - This is a "normal" repo that you have set up yourself, and users within the same group can 'pull' (update your code from) or 'push' (apply changes) to it. Likewise you can pull from/push to other peoples shared repos. These types are indicated with --bare and --shared respectively on the git init command. When not specified, git init will create a shared repository. Click here if you need more info. Although git can detect renames, using the mv command on a file, it's probably best just to think of this as deleting a file and creating a new one. Due to the fact that detecting renames is expensive, it is turned off by default and the -M switch has to be given to git log if you do want to see renaming. You may wish to configure meld to act as your merge tool. Also, you may wish to have 3 files checked out to act like SVN and manually do your diff/merging. It is important to note that the Git protocol does not support authentication. To restrict people's access to your codebase, you need to use the other tools at your disposal. E.g. Setting up an SSH account(s) for the other colleagues to access your repo on. This is unlike SVN, whereby for each Repo, you can configure specific username/password pairs which were used for the 'authors' in the logs. In Ubuntu 13, you may need to perform these extra steps. Stack Overflow - Why are there 2 ways to unstage a file in git? Stack Overflow - How do I show the changes which have been staged?